Vuejs and Firebase based CMS. Making Tamiat your starting point. Integrating Tamiat into an existing project. Clone the CMS repository and install the dependencies. Log in to firebase console using your google account and create a new firebase project. In the authentication section, add a new user by providing an email and a password. Setup your database basic security rules by going to the database.rules.json file in your project and fill in your UID. yourUID and anOtherUID are the uids of users with permission to write to the database. They look something like this "Lxgqp3FmcPVU6UYO6gNdkn1i0ok1". You can obtain a user uid from the authentication section in the firebase console. Copy your project configurations from WEB SETUP (in Authentication section of firebase console) and paste them in config.js file by replacing the existing ones. Run the firebase init command (if you haven't installed firebase yet, do so by npm install -g firebase-tools), select your firebase project from the list, use the default database rules already present database.rules.json, choose dist as your public directory and configure the project as a single-page app. You can now use firebase deploy to deploy the security rules you just entered (to deploy the actual web app you must first use npm run build or yarn build). Run the local dev server with npm run dev or yarn dev. Access the admin interface by navigating to localhost:8080/admin. Sign in with your previous email and password. Create a new vue.js project based on webpack template. Install the required dependencies by Tamiat. In main.js file, import the external stylesheets and the necessary plugins and activate them. Remember, don't forget to add the router property to the vue instance. Once this is done, you can just follow the same instructions of the first option above starting from step 2. In Tamiat CMS, there are reserved routes that are built in the CMS itself as well as dynamic routes that you can create yourself. With dynamic routes you are in complete control and have the total freedom about the presentation of your content. You can associate the content that you want with the template that you want and give them the url that you want. In order to create a dynamic route you have to go to the Routing section in Tamiat admin area. On the right side, you can see the reserved routes in the CMS (you can not create dynamic routes with these paths). The only required fields in the form are path & template. The other fileds: Content type & Content are optional since some templates are static and don't accept any dynamic content to show. This type of templates shows static content instead (like the default About us template). After you fill in the form and click the add button, the dynamic route will be created and added to the Dynamic routes on the right hand side. There, you can test it by clicking on the path link that will open the new route in a new browser tab. After the creation of the new route, you will have options to edit all it's components (path, template, content type & content) in addition to completely deleting it. You just need to hove over the created route to see those control buttons. Create a new MyTemplate.vue file in /src/app/templates folder. Static templates are templates that contains only hard coded content. They can not be used to show dynamic content (ex: the AboutUs default template). The vue mixin LoadContent will expose your content as a data object called content. There, you can access all the fields of the content you assigned to that route. First, we have to understand the basic concepts and the DB structure. This way, everything we create is custom made. We don't have any restrictions in sense of how our content should be named, what properties(inputs) should it have, on what path should our contents be, etc. After this, you have successfully added the demo data and initialized the DB. Now you can continue on working with contents and fields. How to create Content types and Fields? In order to create content types and fields we have to go to the Content section in Tamiat admin area. 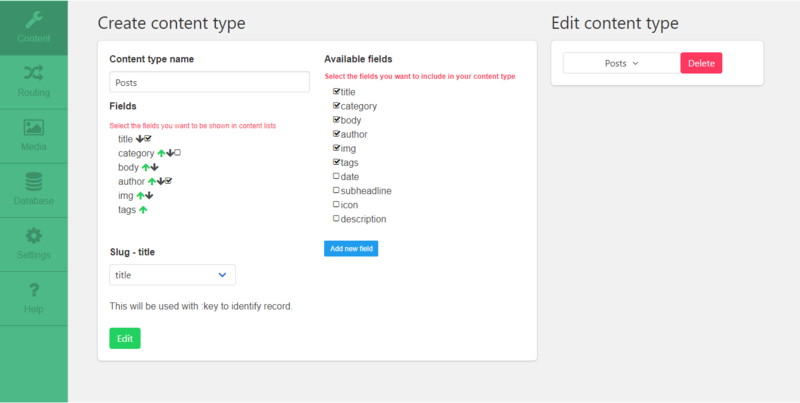 To be able to create new content type we have to define the name and select one or more fields from available fields list. On the right side we have a list of available fields. Those are the fields that are currently available in the DB. By checking a field from that list, we decide to include it in the creation of content type. If we want some fields to be shown later in the UI, we have to check a field from Fields list (only textbox type fields are available). Also, we can reorder fields so that they are stored in the DB as we want. Lets look at the right section. By selecting a content type from dropdown menu, section on the left is populated with data of selected content type. From that point, we can choose to edit or to delete it. By clicking on Add new field button, this block is displayed. Field name and field type are mandatory, but multi value isn't. Next to every fields name in the available fields list, we have two icons - delete and edit. The same block is displayed just now it's populated with selected fields data. We created a new content type, what now? After successfull creation, content types are displayed in the dropdown menu Content in Tamiat admin area. From this point, we can Create (Save/Publish), Edit, Delete, Bulk delete, Select, Filter and Sort contents. Those contents will be displayed later in the app. In the picture above we can see that we have newly created content type, ex. Posts, which has an actual data that is displayed in the table. Notice that only author and title fields are displayed - because those are the textbox fields we previously marked to be shown in content list when we were creating content type. Build blazing fast websites for any CMS or data with Vue.js. A Vue.js 2.0 Content Management System. Touch yourself on the Vue way. A datepicker Vue component. Compatible with Vue 2.x. Works nice on mobile devices.